3.4 oz jar of Truffle Sea Salt. Imported from Italy. 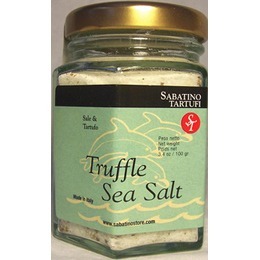 Made by Sabatino Tarufi, Ingredients: Sea Salt, Black Summer Truffle, flavours. Sprinkle over your eggs, meat, fish, etc. this is an extraordinary addition to any home chefs spices.